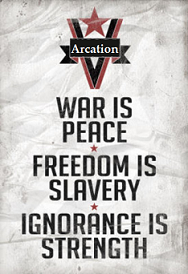 Arcation, as you all know, is a former PvP clan. But now that VanillaCraft is done with global PvP we are ready to embrace new experiences. We will approach v6 with tools in our hands, and plans for building magnificent structures. Arcation will no longer be a strictly centralized clan with only one base and shared resources. In fact, we will not ask you to share any of your private possessions or join the main town. Everyone will be allowed to keep their stuff and build on their own. Only by doing clan projects or by donations will you be supplying the clan with any material possessions. There will be one main base as I already mentioned. Everyone is welcome in it, so once you join the clan contact him to reserve a spot for you. We will also have massive farms connected to the said base. Everyone in the clan will be free to use them (except for fragile farms such as villager ones. You need to become trusted to gain access to those). We expect our members to be active on TeamSpeak. Although this is not a necessity, you will get many benefits from doing it. Such as get to know other members better and quicker, and gain our trust. It also helps making the in-clan community much better and gives everyone a cooler experience whilst playing on VC. As you can see, we deleted most of our members. If someone wishes to join back feel free to PM me. We will try to be as nice as possible to other people on the new map, since we want to join the initiative to make VanillaCraft have a great community. We will build magnificent structures and amazing farms on 1.7, second to none ! 1. You must obey all server rules, not doing this will result in a penalty or in severe cases expulsion. 2. If you're going inactive for vacation or any other reason you must contact the leader. 3. Be nice to other people! If you can't do that with someone then don't speak to them at all. There is only one requirement needed to attempt to join our clan (and stay in it), you must not be in other clans/towns (unless otherwise agreed with me). Reason to this is that we want an active inclan community and best playing experience possible. This is impossible with people being in more clans, as the clan activity/quality degrades. Being active on TeamSpeak/Forums, having a good server reputation and a clean ban record are all things that will help you get accepted. But they are not required and joining without these is not impossible. If you are interested in joining please PM me with an explanation on why we should accept you. Please only reply constructively, any spam or hatred is not welcome. Thank you. Last edited by gogyst on Thu May 01, 2014 11:28 am, edited 38 times in total. Last edited by gogyst on Mon May 12, 2014 2:58 pm, edited 1 time in total. Depending on what you like you can help with one or the other or both! We're a friendly bunch and have a lot of fun on teamspeak. With a lot of our old members dieing we want some new folk to play with. So don't hesitate to send us an app! Last edited by walkersgaming on Sun Nov 03, 2013 11:55 am, edited 2 times in total. I really hope this goes out well. You have my blessings! I have many plans for the new map. I can't wait to build a PvP/Spleef arena in the main town. Oklahoma Bears (OB) stadium ftw. In addition to the sports section, it will of course feature a chapel with stained glass added to it. Now all the superior and fateful VC players like piethingy or Vacar can go get enlightened some more in it. Welcome Donutman52 to the clan! Make sure you guys keep the applications coming. Welcome to the clan Donut! Cool. I would say that I would like to join, but then after like a week I would disappear for like months. So yeah. JackSellington wrote: Cool. I would say that I would like to join, but then after like a week I would disappear for like months. So yeah. It would be the best week of your life! gogyst and I will be laying out a rough plan for the new map in the coming week or so. Drop in on TS sometime before the new map so we can talk about what you would like to do, I'd like to hear everyone in the clan's ideas. Damn! Nice pickup with Astro. He is a really solid player. Vacar wrote: Damn! Nice pickup with Astro. He is a really solid player. Haha! It's actually pretty funny, I use tons of fantasy football terms in everyday scenarios by accident. It's a force of habit I guess. Welcome Austincd118 to the clan! Also attention all members, I'll be writing a PM to you soon, containing some starting plans for v6. Just so you know in detail about what the clan will be doing and how you can help out when the map comes out. Last edited by gogyst on Tue Nov 05, 2013 4:14 pm, edited 1 time in total. Welcome guys! Look forward to playing with ya! piethingey wrote: Welcome CriticalCreati0n to Arcation! Welcome CriticalCreati0n, glibby, dr_drk and ABB13 (heh) to Arcation! Yay for recruitment day. I'll be sending a PM to you guys soon. Would that have anything to do with you throwing it at a wall?